After many hours of research on this forum and watching hours of youtube videos, I finally shot my first soft plastics today. Rather than bring me a standard DIY starter kit, Santa took my list of items quite seriously and brought me just about everything I needed to begin my journey into making my own soft plastics. I'm an avid kayak bass fisherman, and being able to roll my own just makes sense for me. I've always found baits that will work, but I've always wished some were just a bit different. Now I have the means to do so, and I've had a blast today so far. I didn't get too crazy, but I wanted to shoot a bait I've wish I had for some time....a truly clear fluke with shad colored glitter(s). 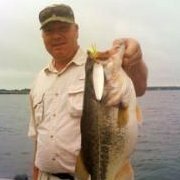 I came up with something that will do well on lakes I fish here in TX, but next time I will use a bit less large black flake. Thank you all for the tips, do's, dont's, and the plethora of knowledge and willingness to share. I truly appreciate it. Here is the link to the gallery with the results. Great job. I'm also really new at this and my first mold was that Wutz-it. It makes a great bait. Your colors look awesome. Those are beauties!! Nice goin'! Nice baits, Wil. Wish my first ones looked that good. Folks, thank you all for the kind words. I really appreciate it.